Every small business owner worries that their business may not succeed. They pour their life savings into the business, they work long hours in the hopes of breaking even, and they go through more stress than they would as an employee in a standard office job. If you’re an entrepreneur or small business owner, it’s imperative that you have an experienced attorney on your side when your business is facing a legal case. Whether one of your employees or partners has breached a contract or your business is being audited and faces legal repercussions, you don’t have to go through this process alone. Clients find that Bill’s strength lies in aggressive, thorough representation in each business legal matter. Unlike service provided at many large law firms, Bill independently handles each aspect of a particular lawsuit or dispute. He tactfully uses his skill and experience in every case to achieve the best result for his clients. Bill regularly consults with clients on key decisions to promote cost-effective litigation. He also believes that his reputation and ability to try matters provides a substantial benefit to clients in the event it cannot be resolved amicably. Whether your business is small or large and your case is a mere inconvenience or a business-threatening issue, you will get Bill’s personal attention at every point along the process. Non-competition agreements. Representing former employees, sales representatives and others in challenging the validity of such agreements. Disputes between business owners. Also referred to as "business divorces," litigating partnership dissolutions, disputes under partnership agreements, allegations of fraud, and expulsions of shareholders or officers. Business valuation cases. Appraisal actions and claims based on warranties in purchase agreements. Entertainment industry cases. Litigating disputes concerning rights to original recordings, copyright infringement, and recording contracts. He can help you with small questions and big cases, saving your business from the repercussions of handling your case alone. 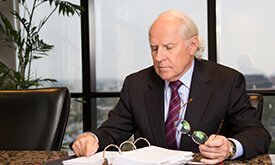 If you are seeking legal representation in southern California, look no further than attorney William B. Hanley. He has been in practice since 1974 in a wide range of legal areas, including employment law, environmental law, personal injury, and trust, business, commercial, real estate, and construction litigation. Bill works closely with both individuals and businesses, and he provides a personal involvement in each client’s unique issues. Contact him today and give your case a fighting chance in court.